Evidence gathered from NERVA I and the work done on PBR indicated fuel elements survival at high temperature and pressure are among the critical issues. Driven also by the need to extend the life of fuel elements in the reactors powering the nuclear airplane planned in the 1950s and 1960s, USAF developed the CERMET reactor concept, and tested a single fuel element to check improvements in its working life [Lawrence, 2008]. In a CERMET NTR the fuel is stored as 235U-rich UO2 encapsulated by, or dispersed in, tungsten, molybdenum or tungsten-rhenium. No moderator (e.g., graphite) is interposed between fuel and jackets, so that the energy spectrum of fission fragments is broader, up to O(1) MeV. The main task of the refractory metal is to contain fission fragments better than more conventional ceramic or metal matrices, i.e., with less damaging structural effects. CERMET fuel in this form has been tested at temperatures of order 1,900 K (in the US and Russia) with excellent results. The maximum operating T of CERMET fuel elements is 2,500 K; lifetime up to 19,000 hours at 1,900 K has been demonstrated, even after fuel elements were cycled through many restarts and shutdowns. For this reason, this type of NTR technology is considered best suited to OTV propulsion, where engines must be turned on and off very reliably for many years. The spatial density of fuel is not as high as in PBR: in fact, the estimated thrust/weight ratio is only 5-6. Pressure losses of order 30%, very high, contribute to the low absolute performance. 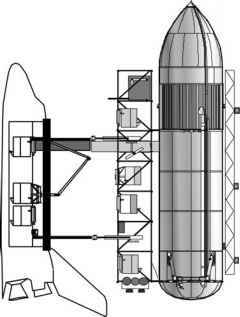 In fact, the Isp predicted in future rocket engines embodying this technology is only about 900 s. The major advantage of this concept is therefore its very attractive and robust fuel elements technology, resulting in the ability of multiple restarts and (presumably) long maintenance-free engine life.